A cleanroom (according to the norm ISO 14644-1) is a room, or a series of rooms, where the concentration of particles is controlled in order to minimize the introduction, generation and retention of particles inside. Parameters such as temperature, humidity and relative pressure are also kept at a precise level. 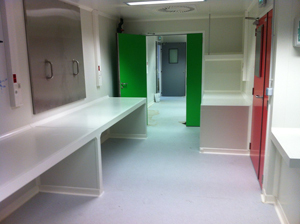 Cleanrooms are used in areas which are sensitive to environmental contamination; the pharmaceutical industry, the hospital sector, biotechnologies and other areas of biology, the food-processing industry (in particular the cutting rooms), cosmetics, etc.